Published on February 4, 2019 in Equipment & Products, Featured Article and National. Closed Tags: construction, construction industry, contractors, Enerpac, equipment, heavy equipment, lifting equipment, Simplex, tools, WWII. Editor’s note: It’s interesting to look at today’s tools and equipment and reflect onthe roles it pllayed in history. Enerpac’s history takes us back to the days of WWII. We hope you enjoy this history lesson. With a rich history of company transition and growth, Enerpac has deep roots dating back well before the WWII era. Known then as Hydraulic Tool Company, Enerpac supplied devices and products that were used during and after the war. These remnants of the WWII era continue to be found across Europe to this day. Lugentz Florent of Belgium found a Simplex Model 29 Mechanical Jack, manufactured in Chicago, IL, in the middle of a Belgian forest in fall of 2016. The forest is close to where WWII battles took place, which means the jack had been sitting in the woods unnoticed for over 60 years. It turns out this jack is the “great-grandfather” to Enerpac’s Simplex Model RJ2029 Ratchet Jack. It has an 18-inch stroke, 20-ton support capacity, and 15-ton lifting capacity. The product number 29 transformed into RJ2029 over the years as the product line expanded. The Simplex Model 29 was used in Western Europe during WWII and after, for bridge repair, lifting and positioning operations. Simplex developed this “no hydraulics” system at the turn of the 20thcentury, manufacturing these jacks for over 100 years. The product is still used today for work on railway track systems. 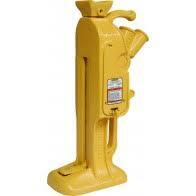 In 2007, Simplex was acquired by Enerpac and continues to be a world leader in mechanical jack systems. 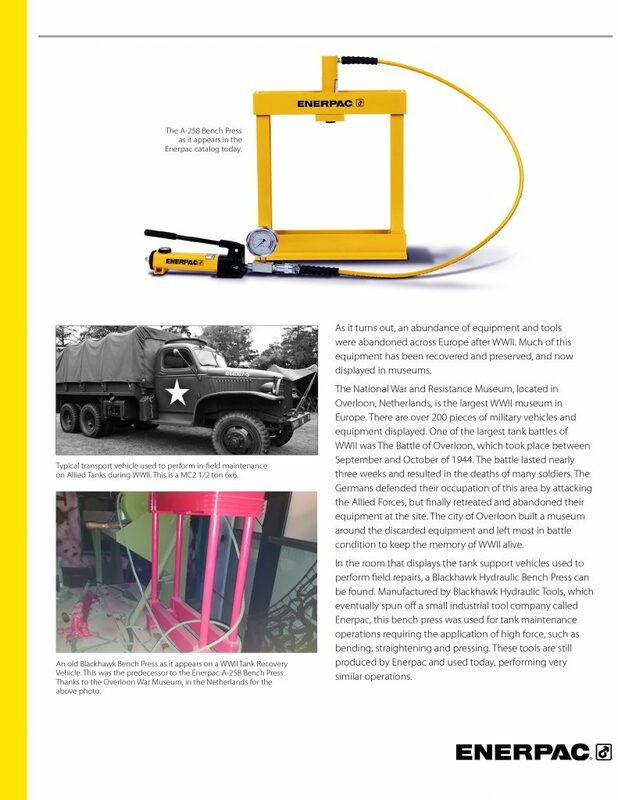 Not only have Enerpac’s products transformed throughout the years, but they have also been designed and created for specific solutions that were needed after the war. In the years following WWII, Germany rebuilt their infrastructure and transportation systems. While doing road maintenance and building new bridges, embedded, unexploded ordnance left from the war were found. These munitions need to be defused before being removed from their locations to prevent personal injury and property damage. 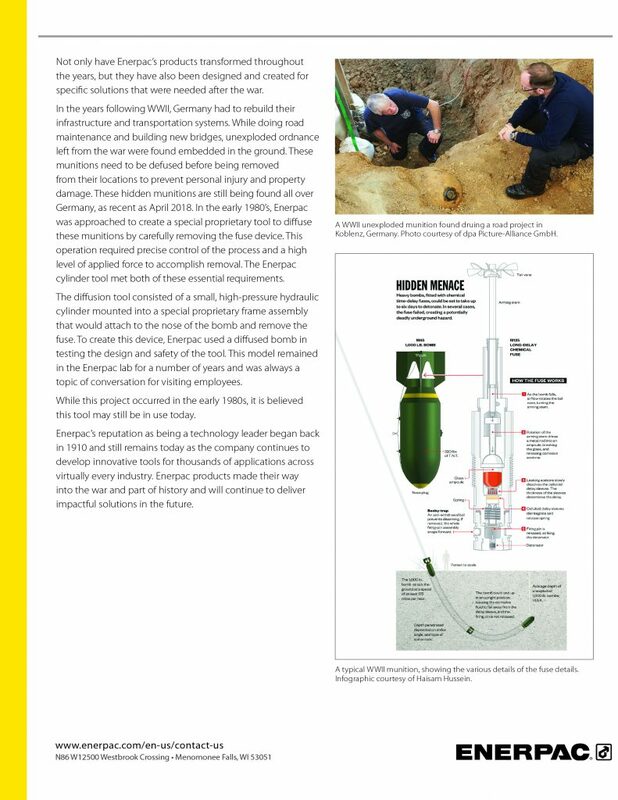 Enerpac was approached to create a special tool to diffuse the bombs by carefully removing the fuse device. This operation required precise control of the process and a high level of applied force to accomplish removal. The Enerpac cylinder tool met both of these essential requirements. The diffusion tool consisted of a small, high-pressure hydraulic cylinder mounted into a frame assembly that would attach to the nose of the bomb and remove the fuse. To create this device, Enerpac used a model in testing the design and safety of the tool. This model has remained in the Enerpac lab and is always a topic of conversation for visiting employees. While this project occurred in the late 1980s, it is believed this tool is still in use today. In addition to hidden munitions, an abundance of equipment and tools were abandoned across Europe after the war. Some have been recovered and preserved, and are now displayed in museums. The National War and Resistance Museum, located in Overloon in the Netherlands, is the largest WWII museum in Europe. There are over 200 pieces of military vehicles and equipment displayed. One of the largest tank battles of WWII Battle of Overloon took place here between September and October of 1944. The battle lasted nearly three weeks and resulted in the deaths of many soldiers. The Germans defended their occupation of this area by attacking the Allied Forces, but finally retreated and abandoned their equipment at the site. The city of Overloon built a museum around the discarded equipment and left most in battle condition to keep the memory of WWII alive. In the room that displays the tank support vehicles used to perform field repairs, a Porta Power hydraulic tool can be found. This tool from Applied Power, the parent company of Enerpac, was used for maintenance operations requiring the application of high force, such as bending, straightening and pressing. These tools are still produced and used today, performing very similar operations. Enerpac’s reputation as being a technology leader began back in 1910 and still remains as the company continues to develop innovative tools for thousands of applications across virtually every industry. 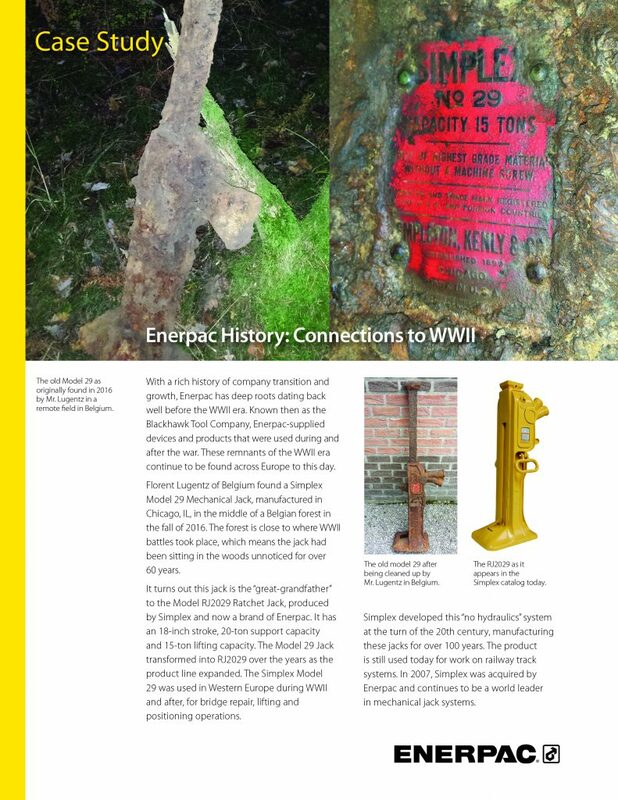 Enerpac products made their way into the war and part of history and will continue to deliver impactful solutions for the future.